There is always much to like about Ian Whates’ stories. He writes accessible science fiction with a thought provoking edge. In this case, the thought provoking is toned down a bit in a venture into space opera. Pelquin’s Comet is an adventure story with an appealing and varied cast. We have a ship, a crew and a hunt for ancient artefacts, quickly complicated by greed, addiction, botched repairs and bullets. 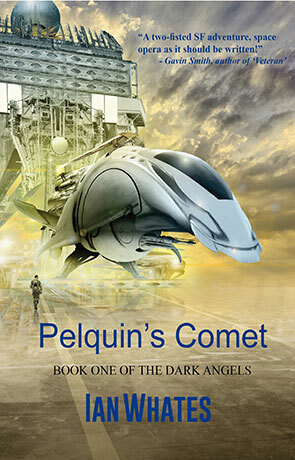 After an initial set piece to establish the competence of one of our protagonists, Drake, an agent for the First Solar Bank, we dive into Pelquin’s story; he’s worked his way up to own his own ship and renamed it after himself (hence the book title). That perhaps tells you a little about him, overconfident and a little overbearing, with a crew who occasionally suffer the consequences. As we settle into the crew’s quest, life aboard ship becomes a series of scenes where their personal agendas and the main plot play out. Some situations bring memories of Joss Whedon’s Firefly, which is no bad thing. Leesa, the new engineer certainly has a hidden past that reminds you of River Tam, but this isn’t a carbon copy crew by any means. There are new stories being told here and the dynamic between them never settles into compliance or breaks out into war. The book is well paced and keeps your interest. Knowing the capacity of the writer, I did occasionally miss the intellectual tone of his other work to start with, but this is a great introduction to an author who deserves to be read widely and has brought an incredible amount to science fiction over the years in many capacities. Pelquin’s Comet is pitched for a young adult audience, but doesn’t stint on the content overmuch and the more thought provoking elements do start to re-emerge once you get to halfway and beyond. Without giving away too much, the themes of group intelligence are a highlight and develop further as the novel moves on. There is a little discrepancy with the titular character, Pelquin. The charisma others see in him is not often apparent and as such he comes across as being a little false. This is not in the vein of Shakespeare’s Antony, described as ‘a triple pillar of the world transformed’ and so given reason for the erosion of his powers. Rather, Pelquin’s fabled charm isn’t something we see too much of, but then that could be owing to the perspective we view him through, that of Drake, sent to protect the investment of the bank. There are one or two clichés in the writing. Bodyguards and ‘goons’ seem to cop the worst of this, being painted as ‘slabs of meat’ and used as punch/bullet bags in some scenes. The conclusion works well, with the quest reaching its climax and a few interesting twists, one in particularly you’re unlikely to see coming. The story stays somewhat on the sunny side though and retains its quality as a pleasant and enjoyable read. Written on 19th April 2015 by Allen Stroud.